Time to pause, reflect and rejuvenate. We currently run three retreats each year. Spring clean your heart and mind on this short but sweet, weekend break in the Yarra Valley, VIC. 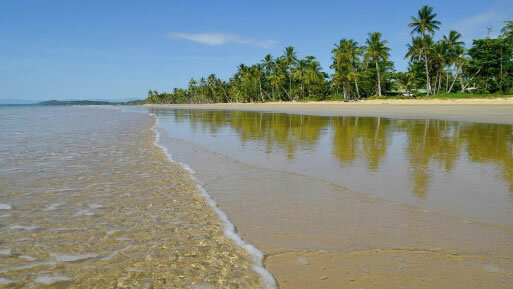 7 days of tranquillity, warmth and rest at Sanctuary Retreat on Mission Beach, QLD. 3 full days of mindful rest and relaxation in the Yarra Valley, held each year over five days leading up to Melbourne Cup day. While many people think that retreats are for advanced practitioners, I think that a few retreats early in one’s practice can really jump start things, allowing one to then make much better use of meditation time off retreat. — Dan Ingram. End: Approximately 2:00pm, Sunday 17, March. The retreat is held at Casa Pallotti, near Warburton. 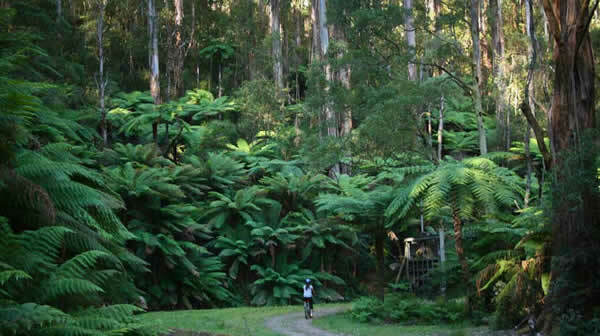 It’s about 90 minutes drive from the Melbourne CBD. Join us for a weekend of rest and relaxation, delicious vegetarian food, gentle movement practices and meditation. The retreat provides you with a chance to get away for a weekend and to relax, recharge and meditate. If you’ve never been on a meditation retreat before, this is an ideal place to start. There will be meditation instruction for both beginners and advanced practitioners, hearty vegetarian meals, plenty of free time and opportunities to walk through the surrounding forest and to appreciate the beautiful scenery. The retreat will be led by Melbourne Meditation Centre teachers, Matt Young and Liu Ponomarew. Accommodation at Casa Pallotti is in a variety of shared dorm-style rooms. We will endeavour to cater for those wanting private rooms, however, this may not be possible (depending on numbers). You may also camp in the field adjacent to the retreat centre. (BYO tent). There are shared toilet and shower facilities. The venue is smoke and alcohol free and no dogs are permitted. All meals are provided, including a variety of teas, coffee and snacks. We can cater for those with special dietary needs, including those requiring vegan or gluten, wheat and dairy-free meals. At this retreat there will be periods of sitting meditation, talks and group discussion. Free time will be given for participants to walk, read and take time off. By car it takes roughly 75 minutes to get to Casa Pallotti from the start of the Eastern Freeway. You may need to allow extra time if traveling through peak hour / long-weekend traffic. We will make every effort to arrange lifts for those who do not have their own car. If lifts aren’t available then you will need to take the train to Lilydale and then catch the Route 683 bus towards Warburton. Alight at Dee Rd, Millgrove and once you have arrived call Matt on 0410 562 843 and we will come and pick you up. The train trip from Flinders St to Lilydale takes roughly 1hr, and the bus trip from Lilydale to Millgrove takes about 45 minutes. Enjoy seven days of tranquillity and rest at Sanctuary Retreat, nestled amongst the lush tropical rainforest and secluded beaches adjacent to Mission Beach and the Great Barrier Reef. You’ll stay in delightful rainforest canopy cabins or huts, be treated to delicious vegetarian fare (as you look out over the Coral Sea) and enjoy a program of user-friendly meditation, yoga and walks through the rainforest and along the beach. In 2019 the Escape the Winter Retreat will run over seven days and six nights from Monday 8 — Sunday 14, July (with options to arrive early and stay longer). The retreat is held at the Sanctuary Retreat Centre on Mission Beach, about halfway between Cairns and Townsville. If you’ve never been on a meditation retreat before, this is a great place to start — and if you are new to meditation and mindfulness you’ll be gently eased into the practice with simple, user-friendly techniques and expert instruction. The atmosphere will be friendly and light-hearted and the schedule includes plenty of free time. For more experienced practitioners there will be talks and discussions on a variety of topics customised to your needs. You will also have the opportunity to join us on short hikes along the beaac and through the rainforest and in a variety of practices designed to stretch, loosen and nourish the body. With secluded beaches meeting the Great Barrier Reef, unique accommodation, a dedicated meditation and yoga space, massage and delicious cuisine, Sanctuary Retreat is an unspoilt paradise and perfect winter escape. 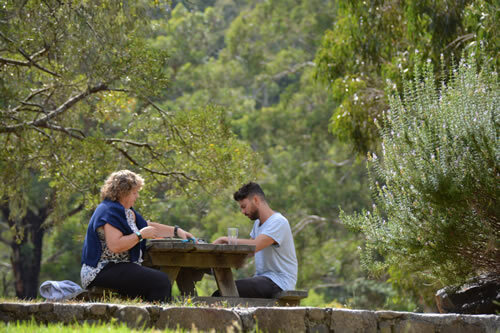 The retreat will be led by Matt Young, Director of the Melbourne Meditation Centre, along with Agnes Gonfaus, from Natural Curiosity. Please note that we encourage participants to engage in ‘respectful quiet’. This isn’t a demand for silence, but rather, an invitation to take a break from continual chat and to enjoy the relative quiet available on retreat. Accordingly, we invite you to engage in conversation during scheduled meetings and discussions, but to minimise talk at other times. Of course, you are welcome to chat on walks away from the retreat centre. You can choose between three delightful and unique accommodation options at the Sanctuary Retreat. Each option is available as a single or twin/double share room. View detailed descriptions and photographs. Rainforest hut with shared bathroom. Rainforest hut with alfresco en-suite. All prices are per person and include food, accommodation, and fees for tuition. (Flights not included). All meals are provided, including a variety of teas, coffee and snacks. We can cater for those with special dietary needs, including those requiring vegan or gluten, wheat and dairy-free meals. View a sample menu or take a virtual tour of the dining room. At this retreat there will be periods of meditation, yoga, qigong, talks and group discussion. Free time will be given for participants to walk, swim, read and take time off. Fully catered retreat with three healthy and hearty vegetarian meals per day, including dinner on the day of arrival and breakfast on the day of departure. Tea and coffee station and a selection of snacks like fruit and biscuits available all day. Daily meditation (sitting and moving meditation). Daily yoga (vinyasa flow and yin yoga, suitable for complete beginners) and qigong. Meditation and mindfulness instruction for all levels. Walks and hikes along the coast and through the rainforest. Yoga mat and props. You can bring your own yoga mat if you prefer. Access to a secluded beach and swimming pool. Charter bus to and from Cairns airport. Note: If you wish to spend extra time (before or after the retreat) on location, just let us know and we will organise it for you. 72 Holt Rd, Garners Beach, Mission Beach. You will need to arrange flights to and from Cairns. A shuttle bus to and from Cairns airport has been arranged (at no charge to you). Shuttle bus to the retreat centre will depart Cairns airport at 2pm on Monday 8 July. Shuttle bus will arrive at Cairns airport around 11am for departing flights on Sunday 14 July. Our November retreat is held each year over the 5 days leading up to the Melbourne Cup. In 2019 the retreat starts at 7:00pm on Friday, November 1 and ends after lunch (around 1:00pm) on Tuesday, November 5. The retreat is held at Casa Pallotti, just a few minutes out of Millgrove, a small town near Warburton, in the Yarra Valley. It takes a little over 90 minutes to travel by car from the Melbourne CBD. 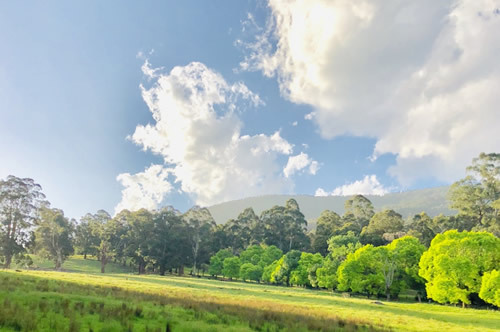 Join us for three full days of rest and relaxation, delicious vegetarian food and personalised meditation and mindfulness instruction in the beautiful Yarra Valley. The retreat is suitable for both beginning and advanced meditators. Rather than teaching you specific meditation techniques, we invite you to meditate in your own way. We’ll offer support and ideas on how to explore and refine your meditation practice and how to work more skillfully with thoughts and emotions. You’ll also have plenty of time to walk, rest, read and relax. You won’t have to sit cross-legged or get up before dawn (unless you really want to) and you’ll be able to choose to participate in a range of activities. The retreat is led by Matthew Young and Liu Ponamarew and focuses on an approach to meditation developed by Jason Siff, and known as Recollective Awareness. It could be described as a form of mindfulness that encourages you to recall and journal about your experiences during meditation as a means of developing greater awareness and insight. The approach is unique and innovative, and although Jason describes it as a Buddhist approach to meditation, it could equally be characterised by its modern, non-religious flavour. More information on the approach can be found by reading either of Jason’s books: Unlearning Meditation, or Thoughts Are Not The Enemy. On retreat, there will be periods of sitting meditation, talks and group discussion. New perspectives are further explored in small group and individual interviews facilitated by the teachers. There will also be time to walk, read and take time off, along with daily relaxation sessions and gentle movement/yoga practices. Please note that outside of talks, group discussions and group interviews the retreat is conducted in silence. This doesn’t mean that you can’t talk; but it does mean that you are encouraged to respect the wishes of other participants for quiet (especially in and around the dorm rooms, within the meditation hall and in the dining area and kitchen). All meals are provided, including a variety of teas, coffee and snacks. We cater for all special dietary needs, including vegan, gluten free etc. Accommodation at Casa Pallotti is in a variety of dormitory-style rooms. There are between four and nine beds in each room, but we generally have no more than four people in any one room. A limited number of the smaller rooms are available for single occupancy (for those who prefer a room to themselves). You may also to elect to share a room with a friend, friends, or partner. Otherwise, the shared rooms are either all male or all female. Single occupancy and shared rooms are offered on a first come basis and payment in full is required at the time of booking in order to reserve a single occupancy room. You may also camp in the field adjacent to the retreat centre (BYO tent). There are shared toilet and shower facilities. The venue is smoke and alcohol free. Pets are not permitted. Thanks for all of your efforts over the weekend. It was a really interesting and opening experience for me. I see myself exploring Recollective Awareness further and incorporating this into my existing practice. It was wonderful to get away, especially to have a few days in nature. I particularly enjoyed my evening ritual – me on the couch, with my book and a few choc-chip cookies. Thanks again for an interesting and useful retreat. As a newbie it definitely helped resolve some confusion and provide a framework for further exploration. The retreat was excellent. It was priced well. The venue was great and the location and food excellent. I particularly liked the 2 hour lunch and all the breaks. This added a component of rest, relaxation and reading to the retreat, which was extremely pleasant. If the timing of our retreat doesn’t suit, or you’d like to do other retreats, here are a few options you might consider. The Adelaide-based Lifeflow Meditation Centre offers meditation retreats ranging from 3 to 7 days throughout the year. The Australian Insight Meditation Network also runs a range of retreats in most states. These generally have a non-religious Buddhist flavour. That is, the meditation techniques may be derived from Buddhist practices, but the teaching itself is largely free of a religious dimension.